The clear benefits of agile development—better collaboration, incremental delivery, early error detection and the elimination of unnecessary work—have made it the default approach for many teams. Agile methods are also being adopted by systems engineering teams to deliver the same benefits. Some developers have questioned whether requirements fall into the category of unnecessary work, and can be cut down or even completely eliminated. Meanwhile, teams developing complex products, systems and regulated IT continue to have requirements-driven legacy processes. So how does requirements management fit in an agile world? 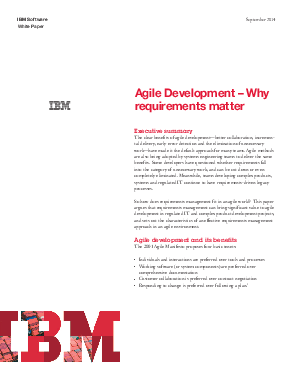 This paper argues that requirements management can bring significant value to agile development in regulated IT and complex product development projects, and sets out the characteristics of an effective requirements management approach in an agile environment.